Maybe humour is the best weapon after all. On Tuesday, ISIS released a video of two Japanese hostages, demanding £132 million ransom from their government to secure their release. Japan has refused to pay the ransom, leaving journalists Kenji Goto and Haruna Yukawa to an uncertain fate. But the Japanese public has responded by hitting Twitter to mock the terror group with photoshopped memes. The hashtag #ISISクソコラグランプリ (translation: "ISIS crappy collage grand prix") has been used 75,000 times since news of the hostage situation broke. The terrorists depicted in the ISIS video have been variously depicted zooming around in space or lurking in closets like cartoon villains. The hashtag has been criticised as insensitive by some who believe that the timing is inappropriate given that the lives of two journalists remain at risk. Over three hours have now passed since the ransom deadline set by the hostage-takers. There is still no word on the wellbeing of either Goto or Yukawa. Others see the parody grand prix as a necessary reaction in the face of extreme terror. 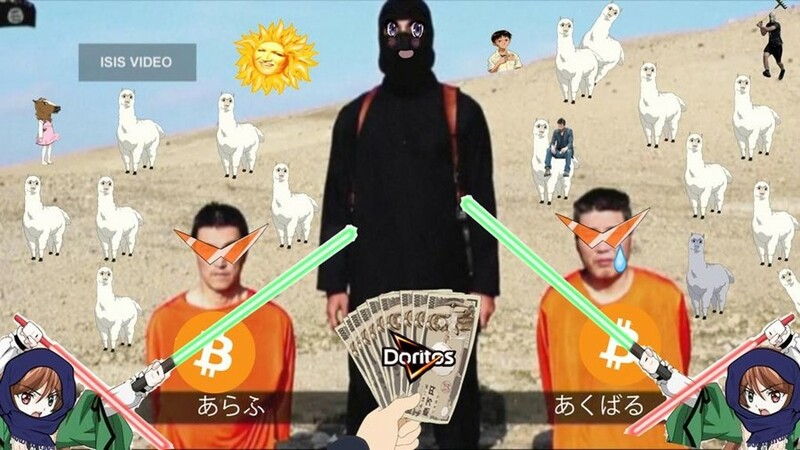 Writing for English-speaking Japanese website Tokyo Desu, Kat McDowell said: "We salute the Japanese netizens participating with the strict intent of de-powering ISIS through the power of humor."